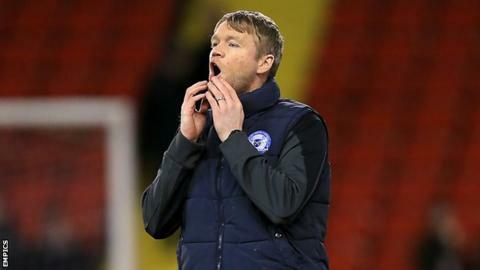 Peterborough United caretaker manager Grant McCann says there will be "no hiding places" for players following Dave Robertson's sacking on Sunday. Robertson was dismissed after just one win from their first six league games this season. "We have good individuals in the squad, but we need them to perform as a team now," said 35-year-old McCann. "There's no hiding places, if they are hiding from the ball they'll be brought off - I've told them that." Former Northern Ireland international McCann was brought back to the ABAX Stadium by Robertson in February, having played over 185 times for the club. He believes "everyone needs to take responsibility" for the situation at the club, who have only three wins from their last 17 games in all competitions, but the more experienced players in the League One side's squad need to "stand up". McCann told BBC Radio Cambridgeshire: "It's easy to hide behind the fact we've got a young squad, so has everyone else in the league. "The young lads have been great for us this season, I've told the older boys they need to stand up. "When I first came to this club I was made captain, I didn't know anyone and I was coming into a changing room full of people who cared about this club: Craig Mackail-Smith, George Boyd, Aaron Mclean, Charlie Lee, Chris Whelpdale. "I had to stamp my authority on them and almost managed the changing room from day one. You have to earn respect and I've told the boys they need to start earning the respect of everyone at the club, including their team-mates and fans." Former Marine Robertson has spoken to his old assistant McCann since being sacked, and the latter, one of the bookmakers' favourites for the full-time post, revealed they have already had a phone conversation. "I owe a lot to him. I've spoken to him and his family and they're really down in the dumps at the minute , but he was one of the first on the phone to me and told me if anyone can get the best out of the players it's you, which was really nice of him," he added. "It's so unfortunate that a man who has been at this club for over 11 years has had to lose his job over a few bad results."